The XE's strongly sculpted hood creates a taut, muscular appearance, Jaguar says. 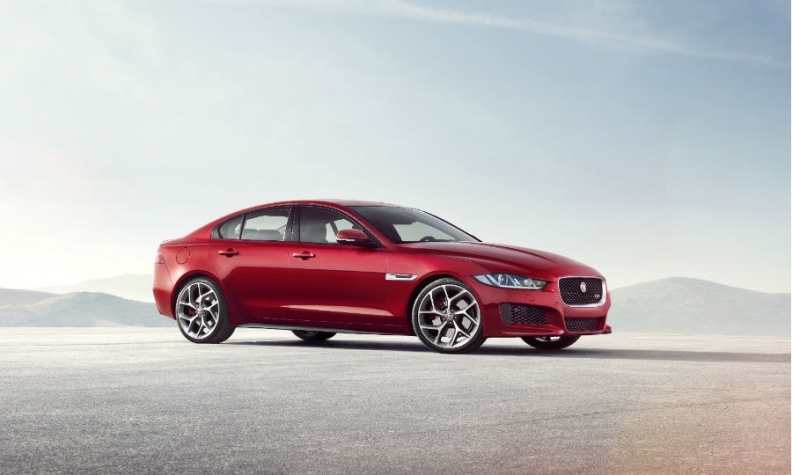 LONDON -- Jaguar unveiled its new XE, calling it the "definitive" sports sedan. The XE's marks the brand's return to the midsize premium segment. "The XE is unbelievably important," Jaguar Land Rover CEO Ralf Speth said ahead of the car's unveiling at a gala event in London on Monday. With its more affordable price tag, "we will have an opportunity to bring younger customers, to bring female customers into the range of Jaguar." Jaguar is confident that the XE will outperform rivals such as the BMW 3 series because of features such as a new lightweight aluminum platform and a rear integral link suspension set-up. The XE redefines the concept of the sports sedan thanks to its advanced lightweight construction, streamlined styling, luxurious interior, and outstanding ride and handling, Jaguar said in a statement. The XE will be the first Jaguar to be equipped with electric power steering, which is tuned to provide responsiveness and offers improved efficiency over hydraulic systems, Jaguar said. The sedan was benchmarked foremost against the BMW 3 series in terms of handling, Paul Atkins, XE vehicle integration manager, told Automotive News Europe. "The BMW is a great car, but I think we've managed to create something that takes it a little bit further, especially for the enthusiastic driver," he said. Jaguar design chief Ian Callum said the XE's styling, with its long hood and short front overhang, creates the "definitive" sports sedan. "The cab-rearward proportions and tight packaging give the XE the appearance of movement even when it's standing still. It bears a strong family resemblance to the F-Type and will stand apart in the crowd," he said. The XE marks Jaguar's return to the compact luxury segment it exited in 2009 when the X-Type ended production. The X-Type, derived by then-owner Ford Motor from the Mondeo, was widely panned by critics for its transverse-mounted engine, Ford underpinnings and retro styling. 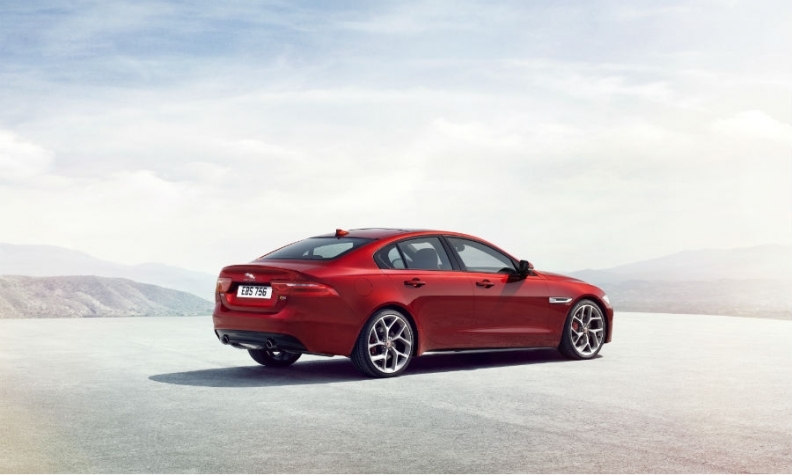 The XE has rising waistline, which adds to the sense of movement. The rear-end styling is similar to the F-Type. The XE will be the first model to use Jaguar Land Rover’s new aluminum-intensive, rear-wheel-drive architecture that is expected to underpin much of the brand’s range in the future. It is also the first vehicle to be powered by Jaguar Land Rover's Ingenium family of four-cylinder gasoline and diesel engines. The 163-hp 2.0-liter entry diesel will have CO2 emissions of 99 grams per kilometer, making it a tax-efficient choice in many European markets. The diesel engine is the first to be produced in Jaguar’s new engine plant in Wolverhampton, England, and will be joined in the future by a more powerful, twin-turbo diesel and a turbo gasoline. "The XE is most efficient and sustainable Jaguar we have ever produced. It's arguably the most important car in our history," the car's program director, Nick Miller, said. The 75 percent aluminum content in the XE's body helps to lower emissions and improve the car's handling. "This is lightest, stiffest and also the most aerodynamic Jaguar saloon ever built,” Miller said. The gasoline engines offered at launch will include two Ford-supplied units: a 2.0-liter turbocharged four-cylinder that will eventually be dropped for a Jaguar-built equivalent, and a 340hp 3.0-liter V-6 supercharged gasoline unit taken from the F-Type sports car to create a high-performance flagship model that will be badged as the XE S.
Jaguar Land Rover has created capacity in Solihull, England, to build 168,000 cars underpinned by its new architecture. XE production starts at the end of this month, initially with a single shift. Speth said that the 168,000 capacity will not be reached until the plant is making three models from the new architecture. He did not say which other models will be built in Solihull, but reports say Jaguar plans crossover and station wagon variants of the XE. Technology available on the new XE includes a new infotainment system with apps that can be migrated from the driver's smartphone, including a calendar. Some models will be fitted with a 3G sim card that will give the car WiFi capability. A smartphone app enables the car to be locked or the heating and air conditioning units turned on or off from any location. The XE is part of Jaguar's goal to triple annual sales to about 230,000 cars by 2018. XE sales are forecast to peak at 63,700 cars in 2016, which approaches the brand's 2013 global deliveries of 74,500, according to market research company IHS Automotive. The XE will be the Jaguar's cheapest vehicle with prices starting at about 27,000 pounds ($44,000) in the UK. The pricing has been closely matched to rivals such as the 3 series. "We've targeted to be like-for-like and feature-for-feature for the segment," Atkins said. The XE will go on sale in Europe early next year with U.S. sales starting in 2016. Jaguar will release more information about prices and engine lineups at the Paris auto show next month.